We want to crowd-source data about a target group we know and our public agencies know very little about. Our target group are 3-7 year olds. There are several studies on older generations but there’s nothing to find on our very young-generations. How do they feel, are they happy, do they have friends? 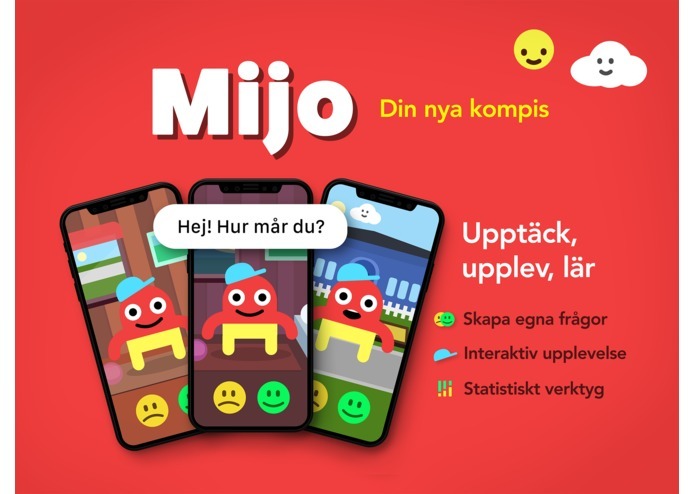 And so on..
Our digital friend Mijo is not only an interactive “tamaguchi”, it also builds a bridge between kids, teachers and our government. 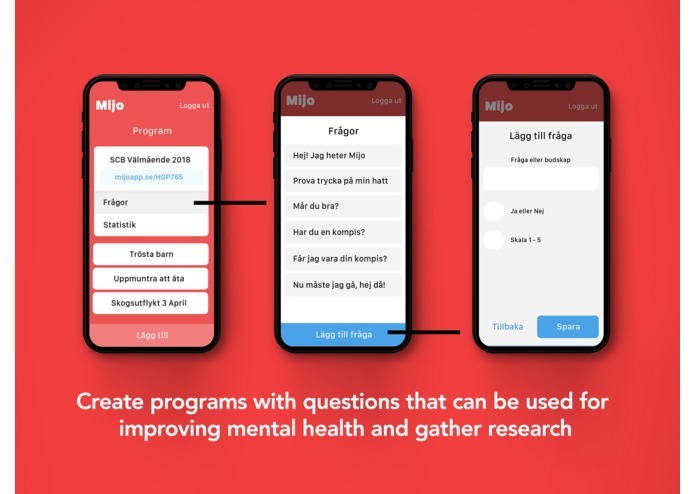 Mijo is a safe environment for kids to open up, and by using professional questions we can gather valuable data on kids wellbeing and map it to geographies and other open data. To connect the adults with the children users we communicated through a server and persisted this communication in a database. In here we also stored the converted map data from SCB which we could use to query which municipality each child user GPS is coming from. The server was a Node.js & Express.js server and it was connected to a MongoDB database. We deployed the server to Heroku and the database to MongoDB Atlas. We used open data from SCB (http://www.scb.se/hitta-statistik/regional-statistik-och-kartor/regionala-indelningar/digitala-granser/) to associate any Swedish GPS coordinate with appropriate coordinate. We used http://mapshaper.org/ to convert the reference systems. To create something a child easily can use, we developed an app. This was done with Xcode, the app then communicates with our server/database so that the information is gathered and stored. The app receives all questions from the database. So each question is actually gathered live! We visited all of the booths and none of the booths could provide us with any data. Children are our future but no one seem to have any data on them. To be able to dynamically use the open map data where we could associate coordinates to a municipality in our tech stack we needed to convert the data extensively. We needed to take it from file type ArcView-Shape with the mapping reference system Sweref99TM reference system to the file type GEOJSON with the more commonly known longitude and latitude values that fit the GEOJSON standard. 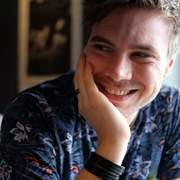 Further an apparent bug (https://jira.mongodb.org/browse/COMPASS-2711) in our database’s implementation of the GEOJSON standard made some city data incompatible while we also needed to manually adjust the converted GEOJSON output to get it indexable. With no previous experience of any of this proved quite labour intensive to learn everything required and finding every tool necessary for the task. We are proud to deliver a beautiful interface for kids using our app, and believe we have put a solid foundation to expand our app with further functionality. But most of all, we think we have a revolutionary idea that can provide great data. Also proud of using open data from SCB. We learned it is very hard to design for young target groups. How can we make the app truly interactive and interesting for kids? Our UX-designer Per did a great job on providing eye-catching graphics. 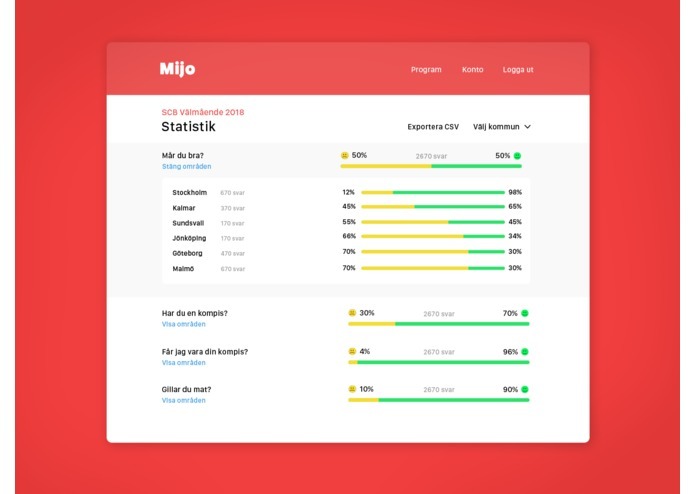 We believe Mijo can be used as a tool across the nation to gather data on kids wellbeing. With this data, we can early on discover children of special needs and act accordingly on both an individual and societal level. Back-end development, devops, fetching open data and market research.